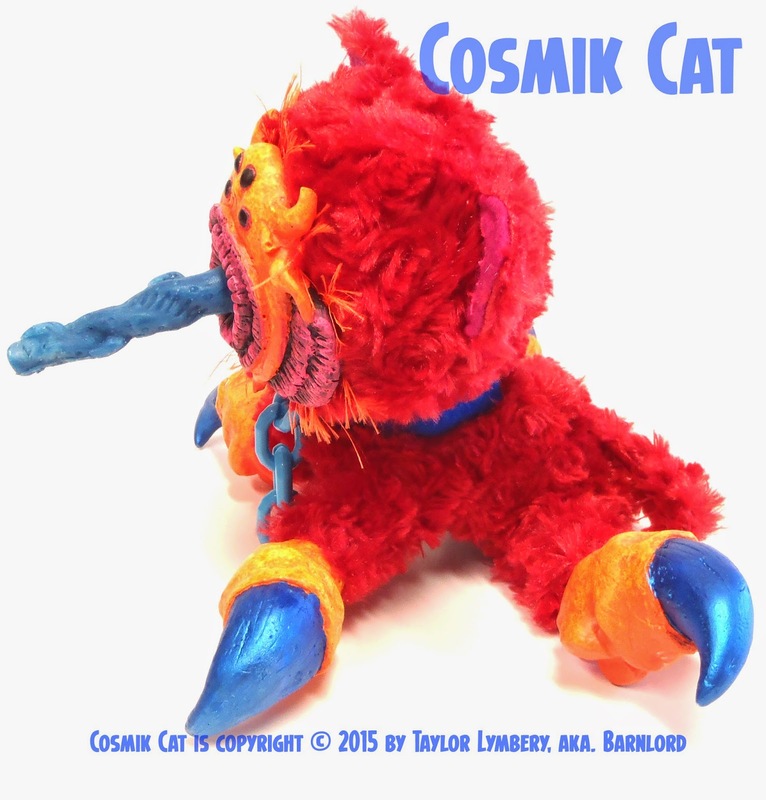 Taylor's Sweet Little Art and Nerd Site: Production Plush Toy- Cosmik Cat! 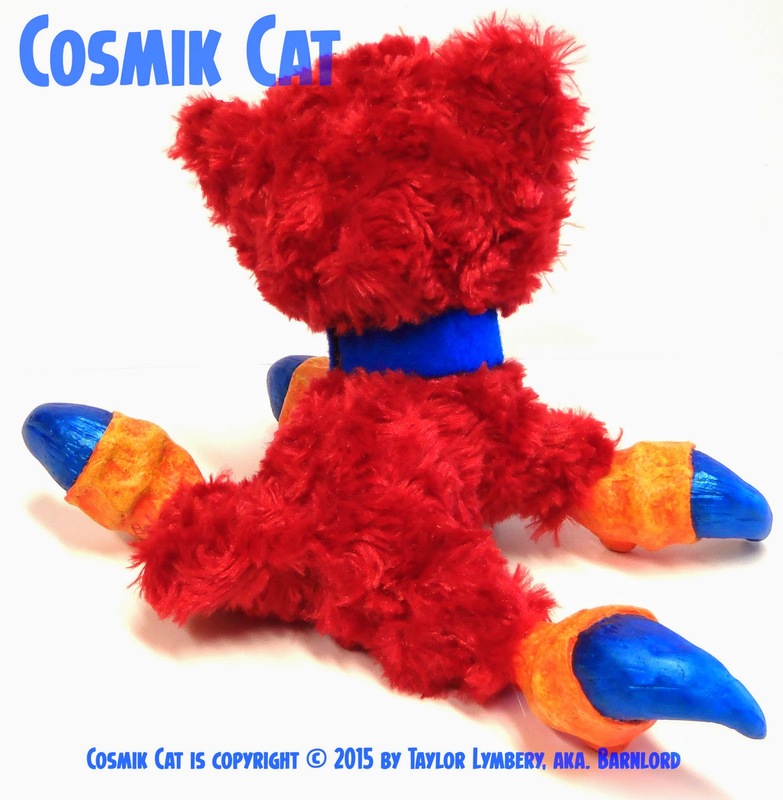 Production Plush Toy- Cosmik Cat! 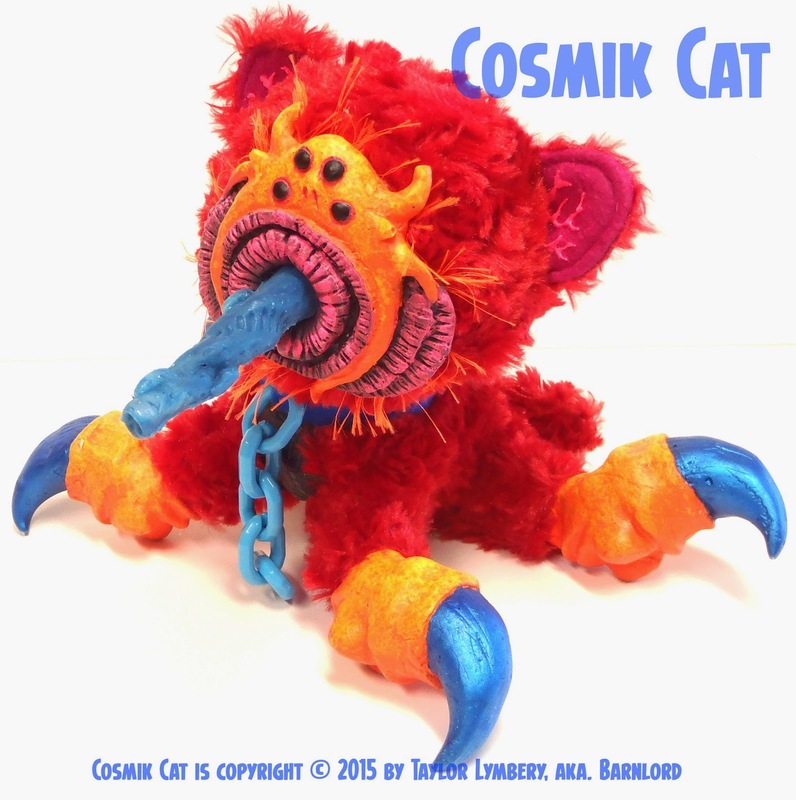 This toy marks a new year for me as a toy designer and fabricator in a couple of ways. First, as I progress as a toy creator, I push myself to be able to make a toy that is able to be reproduced by myself in mass to offer to you all. This toy does that by using molding processes and liquid plastics. Second, it solidifies my ongoing desire to make creatures and monsters for a living! 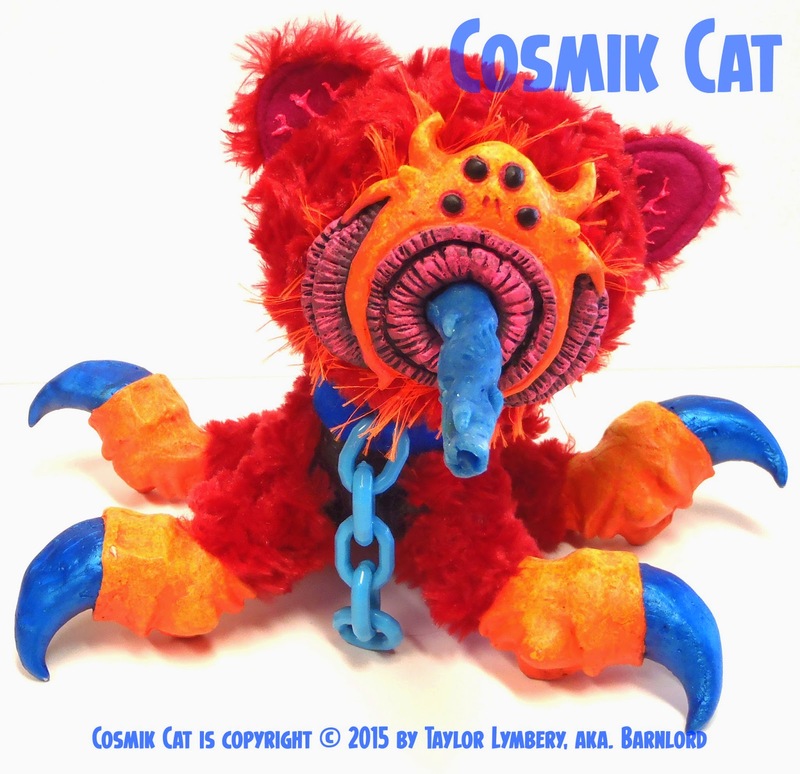 I love making bright and colorful little monsters for you all to take home! If you think about it, my artist name, Barnlord, signifies that I work with creatures. They just happen to look like monsters! 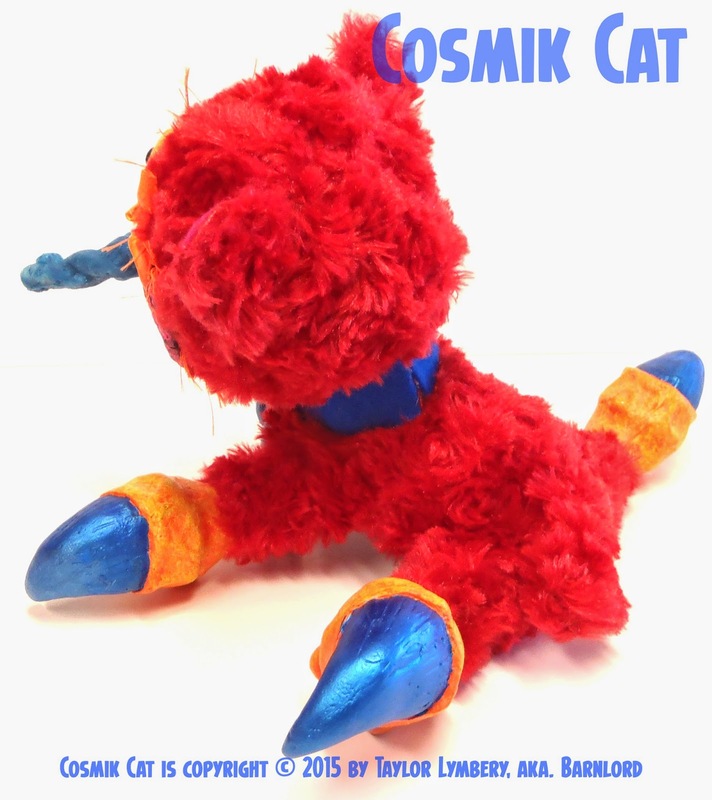 So, without any more hesitation, I present to you, "Cosmik Cat"! This project has been kept hidden in the dark for a while. I've been waiting for a good chance to spring him fourth to the public. 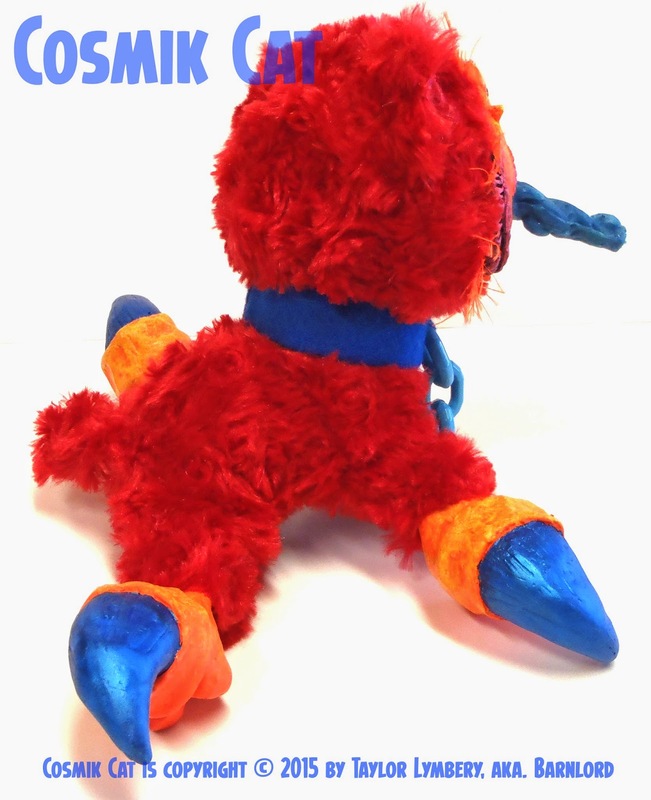 The make-up of this creature is mainly fuzzy plush material with a scaly vinyl underbelly. His face and claws are made of a lightweight plastic with paint application. His tongue is made of a flexible silicon and his collar is a combination of plastic and soft goods materials. The toy pictured is the first prototype. I will have many more made soon. If you'd like to pre-purchase one, send me an e-mail. There are also more pictures of this piece below the important messages below. I have been asked to help my amazing local community of Denton, Texas with their Mini A-Kon on February 28th, 2015. I'll be making a piece to auction there and doing a live sketch session there to add another piece for auction later that day. The money raised will go to the charity, "For the Love of Art": an art group helping the elderly. If you are in the area, stop by and say, "Hi"! 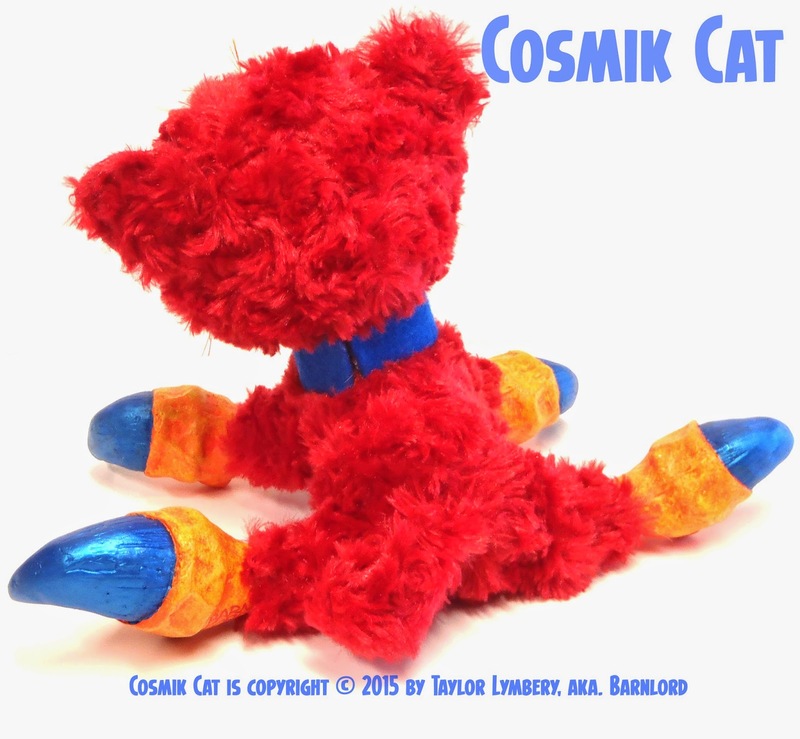 All pictures and design of "Cosmik Cat" is copyright © Taylor Lymbery 2015. All Rights Reserved. You can see this piece in my deviantart gallery as well here. Production Plush Toy- The Wereworm Jeff! Painting of the Day- "Morning Flight"!